A timeless classic, chicken nuggets have always been one of the most popular lunches among children. Not only are chicken nuggets a great source of protein, but they are also lower in calories than most people would expect. 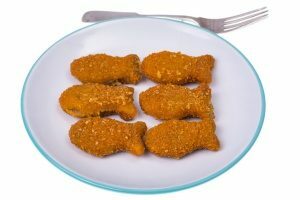 Children generally prefer nuggets that are in shapes, such as dinosaur nuggets, since they are fun to look at and taste amazing! They will stay well insulated in bento lunch boxes due to their relatively small sizes; however, if you are concerned about the inside of the nugget not being cooked enough, you can always gently cut into the center of the nuggets to cook them better. All in all, chicken nuggets are a great food option that can be paired with almost any side. Though they taste great with nearly everything, we would recommend a few healthy sides that your kids can eat alongside their chicken nuggets. For starters, green beans seem to pair fairly well with nuggets. Drain them before you serve them to your kids, however, so that they don’t make a mess. Another healthy choice would be a baked potato. While they may not be mashed as kids would prefer, they can certainly be cut up to where your kids can eat them easier. Lastly, we recommend a fruit such as sliced apples or strawberries since they are easy to eat with hands. As an optional dessert, a small brownie would be most ideal to go along with chicken. 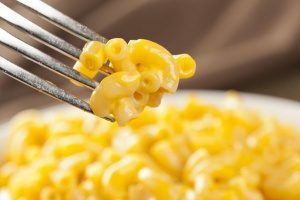 Another food that will never grow old, macaroni and cheese has been enjoyed by kids all across the globe. Macaroni and cheese provides a generous amount of dietary fiber with a decent source of protein as well as potassium. If you want to go the extra mile, you can substitute macaroni noodles by making your own penne pasta and smothering graded cheese on the top of it. Either way, keeping macaroni and cheese in stay-fresh bento lunch boxes is ideal since it can be more likely to pick up chemicals with the melted cheese. In general, it is one of the most delicious, healthy, and popular lunches for your child that will put a smile on their face, guaranteed! While on the theme of foods you can eat with a spoon, try providing a side of applesauce with the macaroni and cheese. Sweetened or unsweetened, it is an excellent source of both potassium and vitamin C. Another great food to pair with a bento lunch box is a vegetable such as corn, peas, or even lima beans if your child tends to enjoy them. Depending on the preferences of your child, both work well with macaroni and cheese. The last side we recommend with this lunch would be white rice, which contains a sensational amount of iron. This way, your child can have a great deal of energy to last them through the day. We believe that a Rice Krispies treat would be a great addition to this lunch, though optionally, of course. 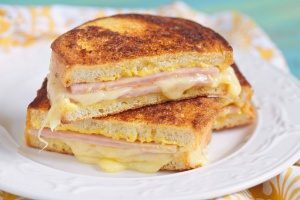 If your child is tired of eating cold peanut butter and jelly sandwiches, try changing things up with a hot ham and cheese sandwich. We all know that kids love ham, and they would certainly love it on a whole wheat croissant as well! Both the ham and the melted cheese boast a great deal of protein, especially if you add an extra layer of ham. You can even add scrambled eggs to the sandwich if your child likes them! The whole wheat croissant is a great alternative to white bread since it has a lot less empty calories, and in our opinion, tastes exceptionally better. By using BPA-free bento lunch boxes to properly insulate this ham and cheese croissant, you can rest easy knowing that your child will not spend the day worrying whether or not their lunch will turn out fresh. Obviously, there are a ton of nutritious sides that complement sandwiches. While chips may be a favorite, pretzels are a much healthier alternative. Pretzels offer a small mix of fiber, protein, iron, and magnesium. A second side we think would go great with this meal would be either carrots or grapes. Both have great nutritious value and would not require your child to use utensils. Likewise, to cap it off, a banana would go great with a hot ham and cheese. A great source of potassium, bananas are often favorite by children due to their sweetness in taste. One or two oreo cookies are a great optional dessert for this lunch since children love the creamy filling inside of the cookies. 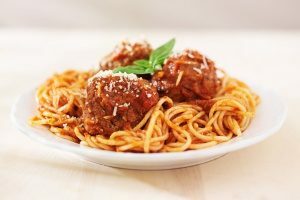 A meal that is frequently enjoyed by both kids and adults, spaghetti and meatballs are an outstanding choice for lunch. If your kid doesn’t like meatballs, then spaghetti with meat sauce is a great substitute. Full of protein and fiber, spaghetti and meatballs will stay well insulated in BPA-free bento lunch boxes so that your child won’t have to worry about their food! If your child isn’t a big fan of or doesn’t know how to properly eat spaghetti, then you can easily cut up the noodles (and even the meatballs) into smaller segments. Be careful with the amount of sauce you allot, though, since you don’t want your kid to feel sick after eating. A light amount of tomato sauce will not only taste great, but will also prevent your kid from getting heartburn. Since spaghetti is typically a food that your kids enjoy, they will want to be able to enjoy their sides too, right? That’s why we feel like the first choice should be a fruit cup. A fruit cup will allow your child to have a variety of fruits and even pick out the ones that they don’t like. Next, a few mini boiled potatoes would work great with spaghetti. They feature a tremendous amount of potassium along with vitamins B-6 and C. Finally, a whole wheat dinner roll would add great taste to the spaghetti. This way, you can provide a fun substitute to garlic bread, which is generally eaten with foods such as spaghetti. We recommend a light dessert option such as a sugar cookie if your child requests a dessert. These popular lunches work fantastic with stay-fresh, insulated dishware. For the best way to keep your child’s lunch warm, try using BPA-free bento lunch boxes that are easy to carry and won’t be too hot to carry.